Sidewalk cafes are so much a part of Paris, so numerous and so individual that it's really impossible to imagine the city without them. How would anyone live in Paris without the cafés, their tables and chairs spreading neatly on the sidewalk, their waiters in black and white uniforms, the chalkboard menus in French? The cafés give you somewhere to walk to as you stroll around the city. Somewhere to stop on the way. Coffee, croissants, croque monsieur or madame, salade niçoise and other standard fare, always accompanied with sliced baguettes and your beverage of choice. It's one of the things you most miss when you're away from Paris. Here is a selection of some of the most photogenic with classic Parisian ambiance. Au Petit Fer á Cheval, the Little Horseshoe, does indeed feature a horseshoe-shaped bar in its tiny interior. Located on Rue Vielle du Temple in the Marais, a usually crowded street except for early mornings. Café de Flore is one of the oldest in Paris and has been known for its famous and intellectual clientele for over a century. It's abundant plant decor is a permanent feature. Next door to Café de Flore is Les Deux Magots, a rival venue and also host to many French and foreign artists, authors and thinkers. On the right bank, just over the river from Île Saint-Louis, is Chez Julian, probably too elegant to be classified as just a cafe but it does provide sidewalk seating and non-stop people watching. The cute Le Bouledogue on rue Rambuteau in the 3rd arrondissement, bills itself as a cafe, restaurant AND brasserie, offering traditional French food including steak tartare and ratatouille. P'tite Bougnate on Boulevard Magenta, not far from Gare du Nord station. 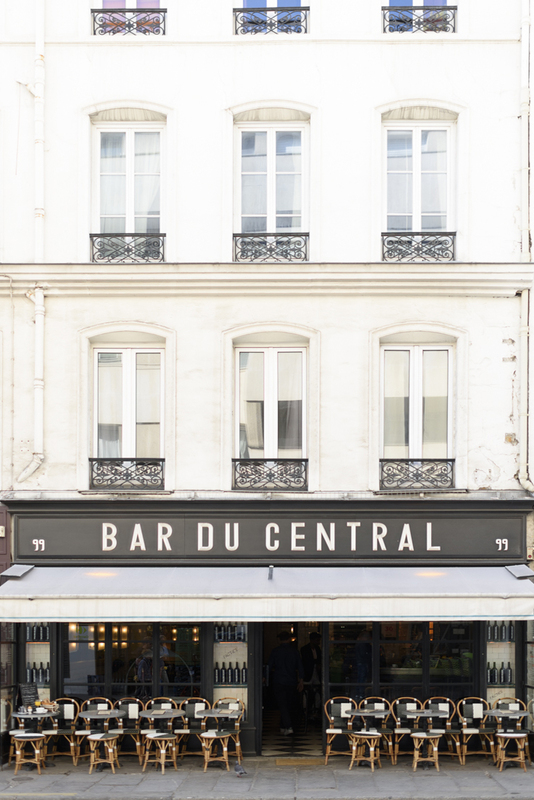 A favorite with locals for their morning croissant and coffee, Bar du Central on Rue Saint-Dominique has a classic bistro interior with a black and white checkered floor, tiled walls and beautiful curved zinc bar. 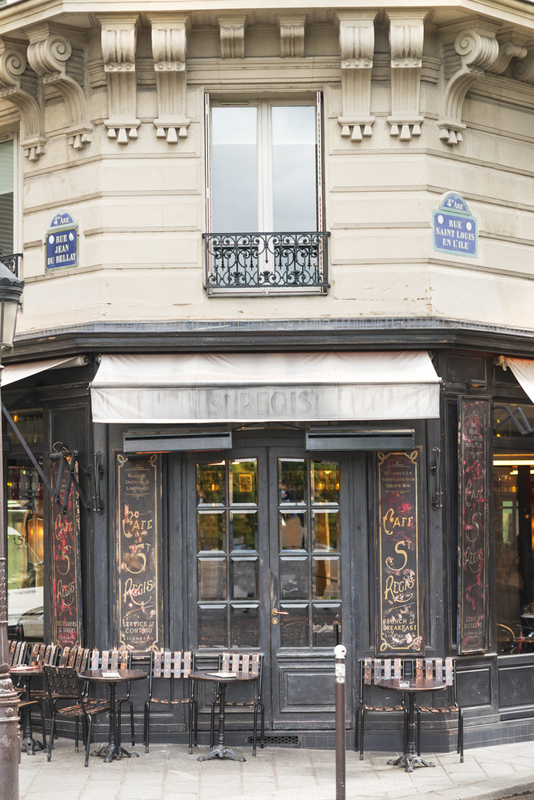 Bistrot Vivienne is a few steps from the Palais Royal and right next to Galerie Vivienne. This wonderful restaurant features old-world decor and a seasonal menu. Not to mention a gorgeous, photogenic exterior! Le Consulat is perched on a narrow street in Montmartre and is an institution in the neighborhood. And rounding up this selection is one of our favorites, Cafe St. Regis, located on one of the very best corners in Paris, on Île Saint-Louis within sight of Notre Dame. Be sure to follow our journal for regular adventures in the City of Light!